Day 7 & 8: the sun is finally out. Alejandro began to gather thermal data; his abilities to catch and probe lizards are out of this world. Also, Tio Paul’s models are having a blast on the cays, thanks Tio. Boy keeps collecting behavioral data, and is becoming quite an expert at catching anoles, particularly A. distichus. 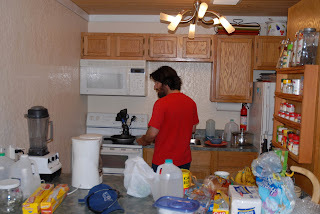 El Jefe is hard at work, not only he needs to do fieldwork, but he is also in charge of cooking, while other members of the team are taking a well deserve rest.